Celebrating 10 years in business, Leitch Translift Ltd (LTL) is a leading truck mounted crane hire and lifting specialist based in Strabane, Co. Tyrone. Managing director Niall Leitch explains more. Leitch Translift Ltd is a one-stop shop for all your truck mounted crane hire needs. Whether it’s plant and machinery, pre-cast products, electric transmitters, wind turbines, portacabins or abnormal loads you need lifted, moved or fitted, the Leitch team have the solution. Providing on-site relocation and installation, LTL’s truck crane hire service saves the customer the additional cost of hiring a mobile crane. The company has a range of trucks from 7.5 tonne to 44 tonne with lifting capabilities of up to 14 tonne to carry out most requirements. LTL’s services are sought all over Ireland and the UK. Hailing from a farming / haulage background, Niall Leitch cut his transport teeth as a low loader driver on mainland Europe with Donnell & Ellis Heavy Haulage Ltd. He went out on his own a decade ago, just before the recession hit. “It wasn’t a great time to be starting a business, but I saw an opportunity because I wasn’t burdened with overheads. I was starting with a clean slate,” he recalls. Through hard work and a willingness to go the extra mile for customers, LTL has grown to employ a dozen staff, including Niall’s nephew Jonathan Leitch, who manages the concrete lifting end of the business. The company runs a fleet of six trucks with mounted cranes and a variety of trailers which combined, allow for transport, lifting and carrying services to be managed in one vehicle. Each of the drivers have completed ALLMI crane training and other Health & Safety courses that enables them to operate a truck crane efficiently and move materials safely. “We take Health & Safety very seriously and adhere to BS7121 which is the British Standard code of practice for the safe use of cranes,” Niall explains. “Our drivers have been extensively trained and we also employ lift supervisors, thus allowing our clients peace of mind that their job is in safe hands. They take any potential risks into account by using the correct lifting methods. Being from farming and civil engineering backgrounds, none of them are afraid of hard work. The same applies for our office staff. Hard work, keeping our costs to a minimum and an unwavering commitment to our customers is what has built this company. Niall runs Scania tractor units, a DAF 105, a MAN artic and ‘Freddy the Foden’, which is currently being fitted with a new truck body and is the pride of the fleet. Always immaculately turned out, the LTL fleet bears a striking blue, white and yellow livery. Niall will soon take delivery of a brand new purpose-built Mercedes Arocs 2551 which boasts a 510hp engine from Mercedes Truck & Bus in Mallusk. Attached to the Arocs is a PM65027SP crane with an 18-metre reach and a 13.5 tonne lifting capacity. The crane was fitted by Sapphire Vehicle Services, while the Arocs will pull a new drag trailer. All told, it represents a £250,000 investment by Niall, who has also recently developed a state-of-the-art garage and storage facility in Strabane. 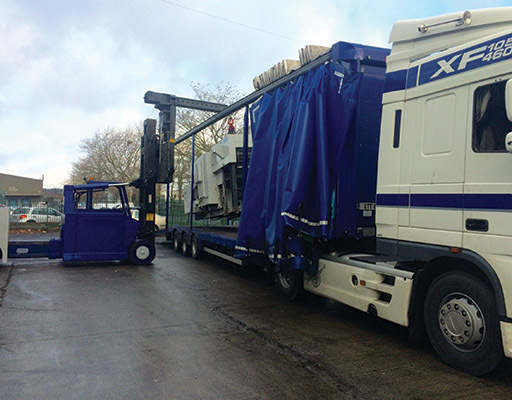 “We’re eagerly looking forward to the arrival of the new eight-wheel rigid lorry and crane. It’s the first truck I’ve bought new, so I hope to get many years’ work out of it. I was also Sapphire’s first crane fitted customer. While most of our cranes are Palfinger and HIAB, PM have a good name too and we can’t wait to see it in action,” the affable managing director continues. LTL’s truck mounted crane hire service is available around the clock to cater for almost any job. The company also specialises in the transportation and installation of machinery plant, wind turbines, boats, electric transformers and concrete products to name but a few. One of the most recent high-profile contracts undertaken involved the delivery, lifting and installation of concrete panels for Macrete Pre-cast Concrete Engineers at Wicklow GAA’s new stand in Aughrim. LTL has also worked on the new national Velodrome and Badminton Centre in Blanchardstown, Dublin 15, which comprises a 250-metre track along with 16 indoor badminton courts. Here’s to the next 10 years of LTL!